An idli is a round savoury cake popular throughout India and neighbouring countries like Sri Lanka, and is a traditional breakfast in South India, especially in Tamil Nadu and Karnataka. 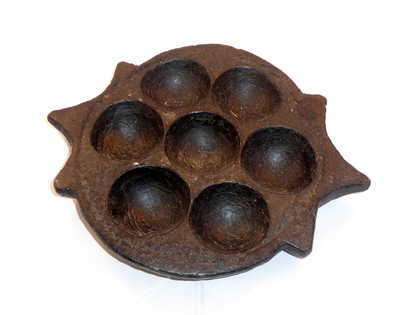 Made by steaming fermented lentil and rice batter, these days in metal trays, but in days gone by in a stone tray just like the one in the picture above. These stone trays make brilliant decorative items and tea light holders. £20 each. Available online and in our Hove furniture store.